Wanna go on a cruise with Victoria? This unique experience to spend extended time with Victoria will take place from December 2-9, 2017, sailing from Miami through the western Caribbean to destinations including Key West, Cozumel, Mexico, the Cayman Islands and more. All are welcome to join Victoria for this once-in-a-lifetime opportunity, but due to cruise line restrictions, only service and support dogs are allowed to join you. It is not required or necessary to have a dog with you in order to take full advantage of the itinerary. 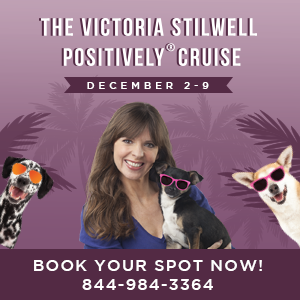 For more information or to book your spot on the cruise, please visit www.positively.com/cruise or call (844) 984-3364.